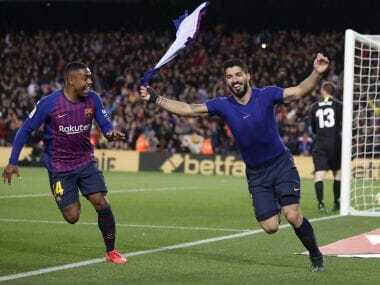 Barcelona: Luis Suarez celebrated his bumper new five-year Barcelona deal in style with a double as the champions defeated Espanyol 4-1 in the Catalan derby to move to within three points of La Liga leaders Real Madrid. However, it was Andres Iniesta and Lionel Messi's skills that stole the show as Barca took advantage of Real's duties in winning the Club World Cup earlier on Sunday to cut the gap at the top ahead of La Liga's three-week winter break. Iniesta teed up Suarez for an early opener before both Iniesta and Messi showed sublime touches for the second eventually finished off by Suarez. 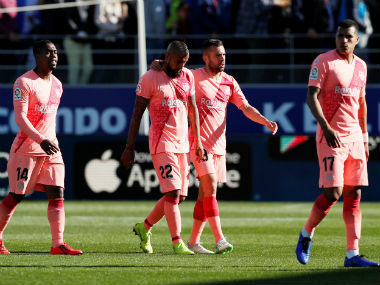 Messi created Barca's third as well for Jordi Alba before David Lopez pulled a goal back for Espanyol as their 10-game unbeaten run came to an end. The five-time World Player of the Year wasn't to be denied, though, as Messi got the goal his performance deserved a minute from time. "Leo's move (for the second goal) is a PlayStation move from a unique player that only he can do," Suarez told Spanish TV Station Movistar. Barca's upturn in form in recent weeks has coincided with the return of veteran playmaker Iniesta from a six-week injury layoff and the Spanish international was to the fore as the hosts dominated throughout. 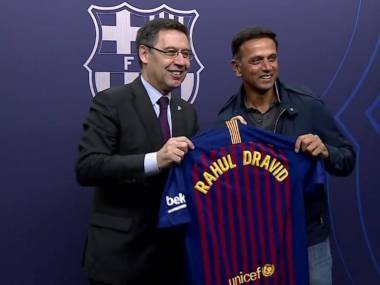 "We've enjoyed watching players in their natural habitat doing incredible, unpredictable things and making us enjoy this marvellous sport," added Barca boss Luis Enrique. Iniesta sparked a sweeping counter-attack on eight minutes involving all three of Barca's star-studded frontline as he fed Suarez, who spun away from the Espanyol defence, before picking out Neymar and the Brazilian's low cross was fired inches wide by Messi. Barca had to wait just 10 minutes more to open the scoring as another sumptuous Iniesta pass was expertly controlled by Suarez and he bore down on goal before slotting into the far corner. For all their dominance in possession, the champions had to wait till the start of the second period to enjoy more clear chances as Messi curled wide from the edge of the box before he teed up Suarez with a brilliant defence splitting pass. This time the Uruguayan was denied by Diego Lopez, but at a cost as the Espanyol 'keeper injured his knee in clashing with Suarez and had to be replaced by Roberto. 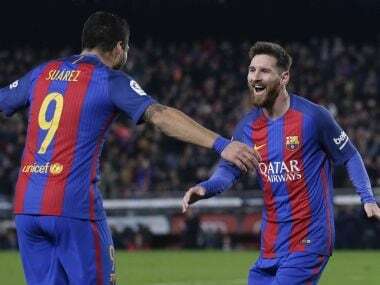 Suarez moved level with Messi as La Liga's top scorer with 12 with Barca's second, but once again the credit should go to Iniesta and Messi as they dribbled past a combined seven Espanyol defenders before Messi's shot was parried by Roberto and Suarez snaffled up the rebound. 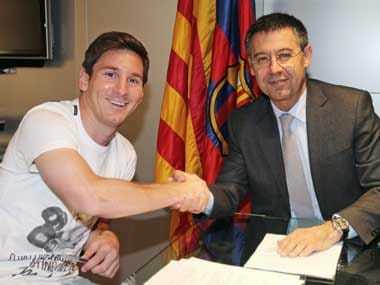 Seconds later Messi tore the Espanyol defence apart once more to leave Jordi Alba free to drill the ball into the far corner. Espanyol did muster a reply to salvage some pride with their first shot on target as Gerard Moreno headed into Lopez's path, who had stormed forward from centre-back to find the top corner. However, a virtuoso display from Messi got the finale it deserved as he and Suarez exchanged a one-two before the Argentine prodded between Roberto's legs.